Numerous clues, safes, locks and puzzles create a game that can test the most clever minds. 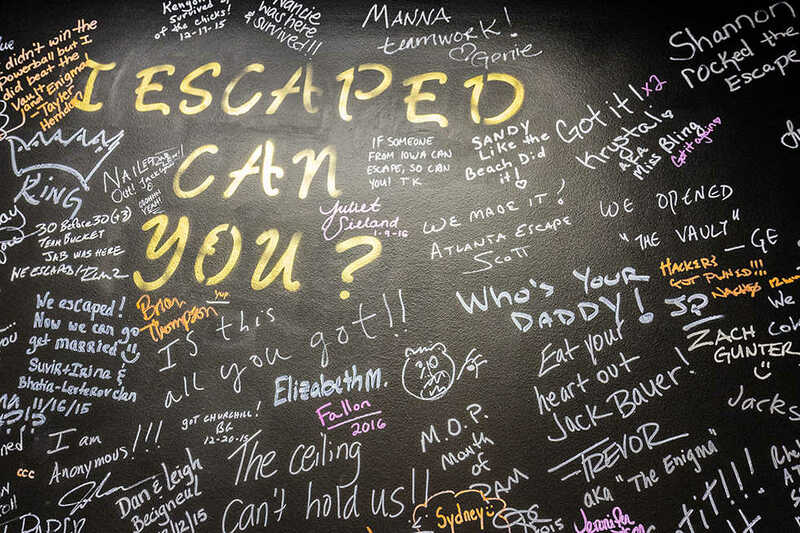 With one hour to escape, the Ultimate Escape Game provides visitors an opportunity to challenge themselves and possibly their friendships. The Ultimate Escape Game is located near Cumberland Mall, which is near the perimeter off of GA-285, a bit of a drive. The game is in an office complex that looks quite abandoned at night, as the rest of the businesses are closed, but once inside, visitors are comforted by a lively staff and bright atmosphere. Two to 12 players are briefed then locked into a small room with the single objective of escaping. Participants must work together to solve puzzles and clues to crack codes. Each piece of the puzzle will unlock a chest, safe or door. Teams can receive up to three hints to help with their flight from the labyrinth of mystifying codes. While an hour might seem like a plethora of time, teams tend to be hard pressed to finish within the last ten minutes. If visitors get out before the hour mark, they get to sign the wall of people who escaped. The complex provides five rooms for different experiences including The Vault, Atlanta, Amnesia, Hackers and Enigma. It costs $28 per person to break out of a room. The high price makes the game more suitable for big group events such as businesses, birthday parties or school groups. The game is a perfect way to promote team building as players must work in tandem to figure out the puzzles before time runs out. While pairs are welcome, they will be placed in a room with strangers, so Tech students might want to get a larger group together and test their brains. The Ultimate Escape Game is located near several excellent food destinations, meaning that students can make it a night of fun and food.